New Release: It’s All About Melissa! Seeing as it was time for Melissa to sit the LOL exam and become a legally operating lawyer, I figured she deserved a one-off book of her own. Legally Red is a full-length, standalone story, and you can read it without having read the rest of the Wayfair Witches books. Melissa Wayfair might be about to sit the LOL exam, but she sure isn’t laughing about it. 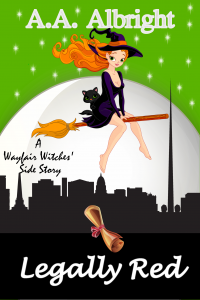 Because if she wants to become a legally operating lawyer, then she has to do more than answer a few questions – she also has to clerk under the most obnoxious lawyer known to witch. But once Melissa has dealt with all of the above, she might have to face her greatest challenge yet – learning how to stand up to her horrible boss.